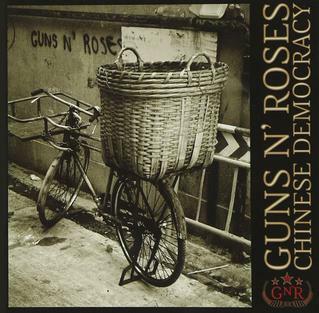 An AP report explains that China is none too pleased by the new GNR album (which pretty much blows, by the way…there are plenty of kickass guitar solos but the songs are weak as hell). BEIJING—A newspaper published by China’s ruling Communist Party is blasting the latest Guns N’ Roses album as an attack on the Chinese nation. Delayed since recording began in 1994, “Chinese Democracy” hit stores in the U.S. on Sunday, although it is unlikely to be sold legally in China, where censors maintain tight control over films, music and publications. The album “turns its spear point on China,” the article said. The Global Times article referred only to the title of the album and not to specific song lyrics. The record’s title track makes a reference to the Falun Gong meditation movement that was banned by China as an “evil cult” and warns “if your Great Wall rocks blame yourself,” in an apparent message to the country’s authoritarian government. Here’s the best part of the article: revelations about the strict regulations on foreign rockers when they perform in China. Long story short, Harry Connick Jr. has a serious bone to pick with Bjork! China approves only limited numbers of foreign films and recordings for distribution each year, partly due to political concerns but also to protect domestic producers. “Beast of Burden”?!?! Chinese censors are frickin’ prudes. Earlier this year, bandleader Harry Connick Jr. was forced to make last-minute changes to his show in Shanghai because an old song list was mistakenly submitted to Chinese authorities to secure the performance permit for the concert. Authorities insisted he play the songs on the original list, even though his band did not have the music for them. That came just a week after Icelandic singer Bjork embarrassed authorities by shouting “Tibet!” at the end of a Shanghai concert, prompting stricter vetting of foreign performers. Thanks for nothing, you Icelandic troublemaker!! Next time you come to New Orleans, it’s goin’ DOWN.